A team came to the area with better drilling technology in 1964, in order to create a successful well. Their plans didn’t go as expected as the water was still too hot for them to deal with. 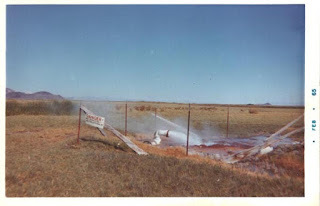 The drilling operation was immediately suspended and abandoned. The team that came in 1964 didn’t cap their drilling ventures properly and they created a small geyser. 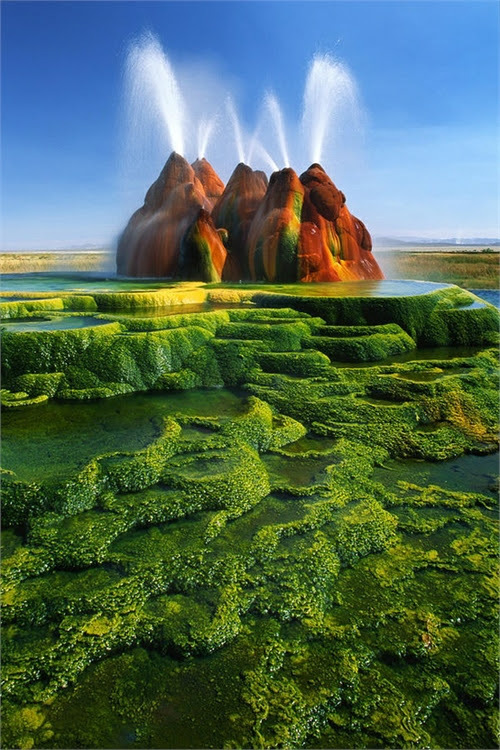 Under extreme pressure and at extreme temperatures, gasses, water, minerals, and nutrients flooded to the surface. This small geyser has grown at an incredible rate creating something that nobody expected. 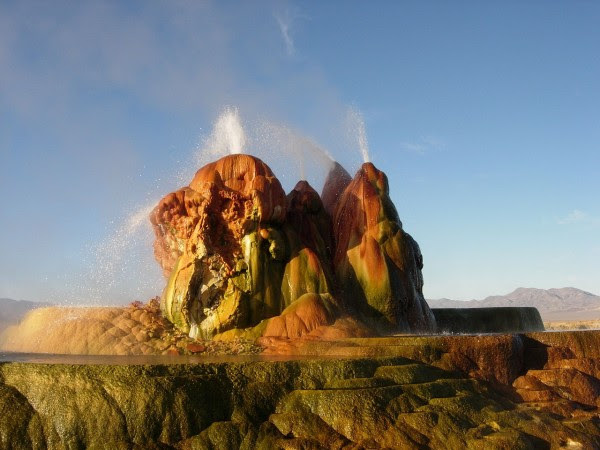 It is not a typical geyser at all. 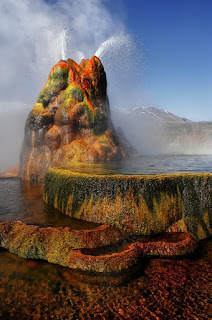 This type of geyser is actually called a fly geyser and it pumps the nutrient rich water above ground where these nutrients and minerals have collected, creating a colorful mountain that continues to grow to this day. The fly geyser in Nevada started out as an attempt to create a well but the drillers got much more than they bargained for when they were faced with scolding hot water. 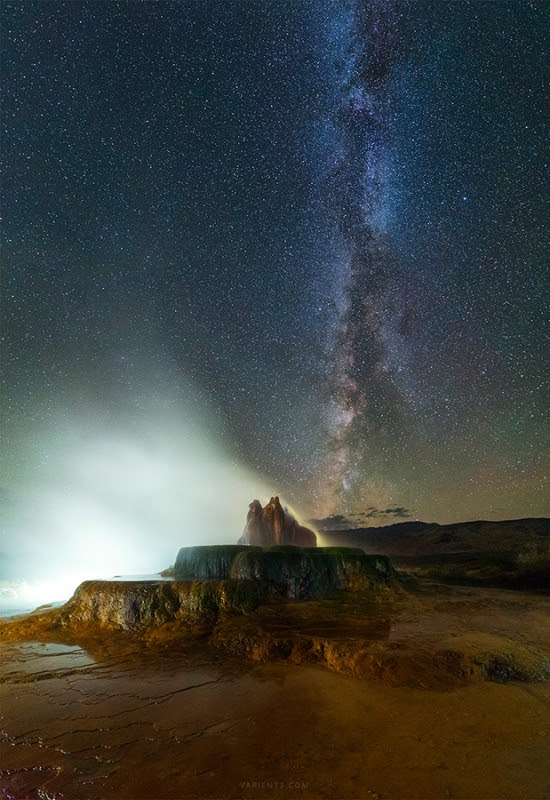 After the operations were abandoned, a beautiful monument created by nature was formed and it has taken on a life of its own, continuously growing and changing. 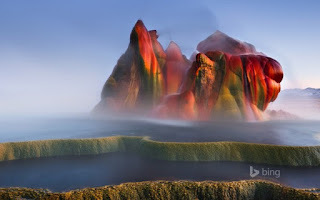 The mineral rich water has created a mountain of colorful formations that have stunned the world. If you get close enough you’re able to see small fish swimming in the hot spring waters and many birds flying around feeding on the organisms that have come to call this magical fantasy land, home. The different nutrients, gasses, and minerals that are expelled from this fly geyser in Nevada react differently to the sun, as well as the oxygen in the air. This reaction creates some magnificent colors that are constantly changing. The longer this geyser flows, the more beautiful it becomes. Look out Yellowstone. It looks like you have some serious competition in Nevada. The fly geyser in Nevada is located on private land so you would need permission to see the rare sight. Many people have contacted the land owners with offers to purchase the land in order to transform this desert oasis into a tourist attraction. The land owners have no intent of letting that happen. This is their own private oasis and they are happy with keeping it that way. 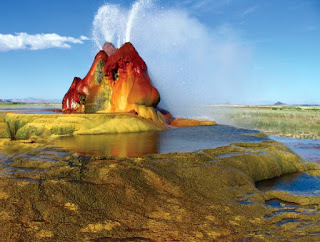 They have refused all offers and keep their property fenced in to prevent the hoards of people that flock to this area to see the geyser from ruining their land. Few people, family and friends, even a few photographers have been allowed access but this is someone’s land. I can understand the owners not wanting too many strangers trampling the beautiful rural area. The land owners will give you a guided tour if you can get a hold of them. The price varies on their mood and the time of year, so if you want to make plans to see this place you better be nice to the owner and his family. 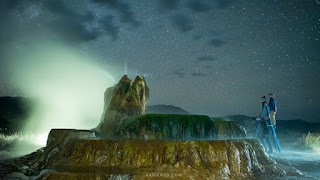 Fly Geyser from Justin Majeczky on Vimeo.